With its strong yet lightweight construction, Blackburn's Outpost Rear Rack is equally suited for a trip to the market or a tour around the world. For a rack that's designed to handle long distance touring, it's going to need strength to hold up to the rigors of the road and support gear. 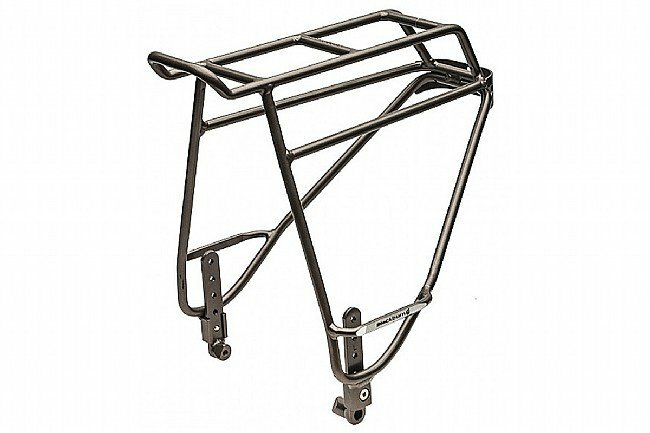 Constructed from a combination of Easton Scandium and 6061 aircraft grade aluminum, this rack can support up to 55 pounds (25 kg) of weight. These materials also have the benefit of low weight (while retaining their strength), so it won't be an additional burden on long trips. Additional details like a light/reflector mount, low and high pannier mounts, and compatibility with a variety of wheel sizes makes this the ideal rack for extended tours. The Outpost Rear Rack is compatible with 26", 29", and 700c wheels, has a carrying capacity of 55 lb/25kg.